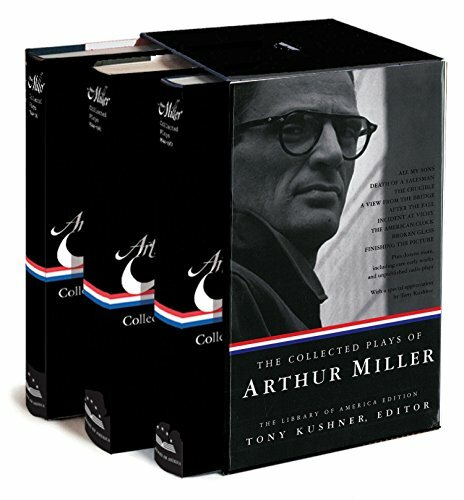 Playwright Arthur Miller was born in New York City in 1915, and The Library of America is marking his centenary with a boxed set edition of all of his stage plays and other scripts for radio and TV. Edited by Tony Kushner (Angels in America, Munich) this collection of over 40 works by Miller represents the full breadth of what he brought to the American stage and dramatic literature. In fact, Miller was a real carpenter, as part of his artistic process he literally built a house with his own hands while he wrote Death of A Salesman. His lesser known plays in these volumes show the many ways he developed his theatrical foundations and singular voice that made him one of the defining American playwrights of the 20th century. A good example is apparent in his three-act play The Grass Still Grows (1939) about the owner of a coat factory trying to save his family and business during the Depression. Each character has different aspirations, and the man’s sons initially have little interest in keeping the business going, but become later become motivated to save it. The domestic drama plays out against the social background of industry’s exploitation of workers and anticipates themes that are explored and refined in his more mature plays. Miller’s previously unpublished radio scripts from WWII reveal his ear for naturalized dialogue cycles and fully drawn characters. They include crude but fascinating historical sketch dramas like Thunder from the Mountains (1942) about 19th century Mexican president Benito Juarez (which starred Orson Welles) and The Battle of the Ovens (1942) a wry parable about personal ethics, or lack of, during the Revolutionary War. Miller shows a pulpier fiction side in his play The Half -Bridge (1942), a New Orleans dockside tableaux about Nazi drug runners, mysterious women, and soused sailors. Also taking on surreal dimension is The Golden Years depicting the fall of Aztec Emperor Montezuma as he tries to understand what the gods are doing to him during Cortez‘s invasion. Written in 1941, and revised by Miller in 1987 for broadcast on BBC radio, it is compellingly different in style and structure. . The Man Who Had All the Luck (1944) was first Miller’s first Broadway production, and its dimensional characters are nonetheless at the mercy Miller’s drawn out plot devices. He quickly adjusted to more efficient and theatrically innovative techniques in his next seismic productions on Broadway, All My Sons (1947) and Death of a Salesman (1949). Death of a Salesman, about the delusions of Willy Loman and his bitterly dysfunctional family, became an allegory of the corrosion of the American Dream. Miller brought equal veracity to such plays as A View from the Bridge with themes of union thugs and underdog heroes trying to do the right thing and losing. It is fascinating to contrast the same subjects in The American Clock (1974/r.1984) styled as a vaudeville into a raucous dissection of the impact of the 1929 stock market crash. Miller deconstructs the American psyche with a parade of characters from different socio-economic classes, a panorama of those who are ruined and go down, those who find a way to survive ,and those who are vanquished on a land of no opportunity. You see Miller’s steely objectivity in works like Memory of Two Mondays (1955), his autobiographical slice of life scenario of a Brooklyn machine warehouse where he worked as a teen to earn money to for college tuition. It is a poignant memory play, but more emotionally forensic than merely nostalgic. One of Miller’s great themes is illuminating human flaws that emerge when one group or community is under attack or oppressed, subjugated, or vilified and others do nothing or join the oppressors. It is most potently realized in The Crucible (1953) with the depiction of the mob hysteria resonating on stage as a direct j’accuse against the tactics in the 50s the House Un-American Activities Committee and Senator Joseph McCarthy. Miller was himself summoned but was not intimidated by the committee and refused to name names of former communist party sympathizers. Miller was summarily charged with contempt of Congress, but perhaps sensing that they were overplaying their hand with Miller, he was not jailed. Other dramas like Incident at Vichy (1964) explore the duality of the tolerance and revulsion of fascism in the minds and hearts of occupied France in WWII. Later, Miller takes us inside a Nazi death camp with his television script Playing for Time (1982) in which he recounts the harrowing atrocities going on inside the camp. Miller adapted the memoir of French cabaret singer-pianist Fania Fenelon and the women who somehow survived the savage brutality and humiliation at Auschwitz where they were forced to play concerts for Nazi officers. It is just as powerful to read now as it was onscreen. In the starkest contrast is a work like The Creation of the World and Other Business (1972) a comedy about God and Lucifer working out the concept of sin with Adam and Eve as the hapless specimens in the experiment. Miller also weighs in on his distain for cultural corrosion and desensitization with Resurrection Blues (2002), satirizing an increasingly bloodthirsty media, in tandem with global politics and a production company’s plans to broadcast the crucifixion of a messianic rebel in South America. And Miller did not back away from autobiographical scenarios, however obliquely covered. One of his most personal self-portraits is the character Quentin, the emotionally cold lawyer in After the Fall (1964). The play was an ambitiously flawed exercise in abstract realism, but was relegated to being viewed as his play exploiting Marilyn Monroe, to whom he was married to for five years. In his notes on the play, Miller adamantly denies Maggie is specifically based on Monroe, but is rather a person who views herself as a victim. The play anticipates emerging experimental genres of the mid-60s even if it reads now as completely overwrought with too many colliding ideas. The clearer portrait of what Miller felt about Monroe is revealed in The Misfits which he wrote for her to help her break out of being typecast as an acting lightweight. It is in the form of a prose-script treatment, so well done that John Huston agreed to Miller’s exacting details for the film. As a prose writer, Miller’s imagery and economy reminds you of Hemingway at his best. The circumstances of filming The Misfits is recounted in Miller’s final play Finishing the Picture (2004). It is a heartbreakingly and sometimes hilarious roman a clef of director John Huston, who was a great friend to the troubled couple, as well as containing scalding proxies for Paula and Lee Strasburg, who are portrayed as manipulating the star for their own gain. Over three volumes, these are just a few examples of the enduring power of Miller’s work. If you are a student of theater or already a Miller reader, there is so much to discover and rediscover in this collection to indeed. Each of the Library of America volumes have a chronology of significant dates in Miller’s life, as well as notes, essays on many of the plays, and commentary. This many years after his greatest successes Arthur Miller remains a towering American playwright for all seasons.